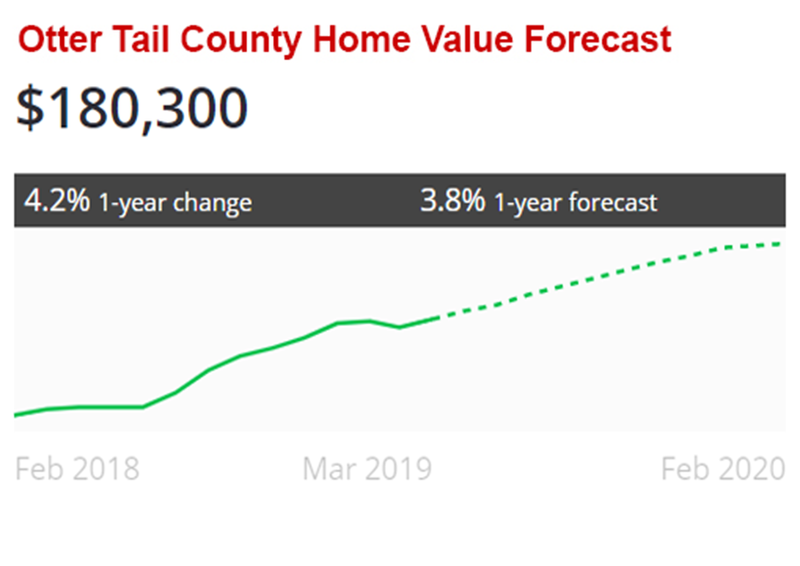 Updated April 12, 2019— The median home value in Otter Tail County is $180,300. Otter Tail County home values have gone up 4.2% over the past year and Zillow predicts they will rise 3.8% within the next year. The median list price per square foot in Otter Tail County is $85, which is the same as the Fergus Falls Metro average of $85. The median price of homes currently listed in Otter Tail County is $189,900 while the median price of homes that sold is $182,500. Note this does not include listings outside of the MLS. Would you like a detailed report of listings and sales in your neighborhood, or perhaps one you would like to move to? Email us at info@homesandlakeshore.com or use the contact form – we’d love to help. While the market is continuing to rise, that rise is slowing down. If you are on the fence about selling, don’t wait to jump into the market. Looking for information Grant or Douglas County? We’ve got you covered. Browse listings by County or City. Or drop us a line- we would be happy to provide a custom report. We can help both buyers and sellers translate this data for your particular area or neighborhood. Sellers looking to market their property should be preparing now. With inventory still low, buyers will face a competitive marketplace, so make sure you are prepared as more listing hit the market this spring. A harsh winter likely will negatively affect the percentage of closed sales this year. List prices are predicted to increase, but at a much slower pace. Homes in Minnesota also continue to appreciate in value, but at a rate slightly lower than the national average. Data collected on home appreciation values over a five-year period from 2012 to 2017 show that homes appreciated by 37.4% across the country, and by 31% in Minnesota. Whether buying or selling, please contact us for a specific market analysis for the area you are interested in, to get the best value for your real estate investment.